This guest post is adapted from a conversation with Kristin Vannatta, Operations Manager at the Peoria PlayHouse Children’s Museum. A few weeks ago Kristin told me, “Working at the PlayHouse has changed the ways I play with my son.” I asked her to tell me more, and the below is an edited version of her answer. This post was originally written for parents, not museum staff, and is cross-published on the Peoria Macaroni Kids website. 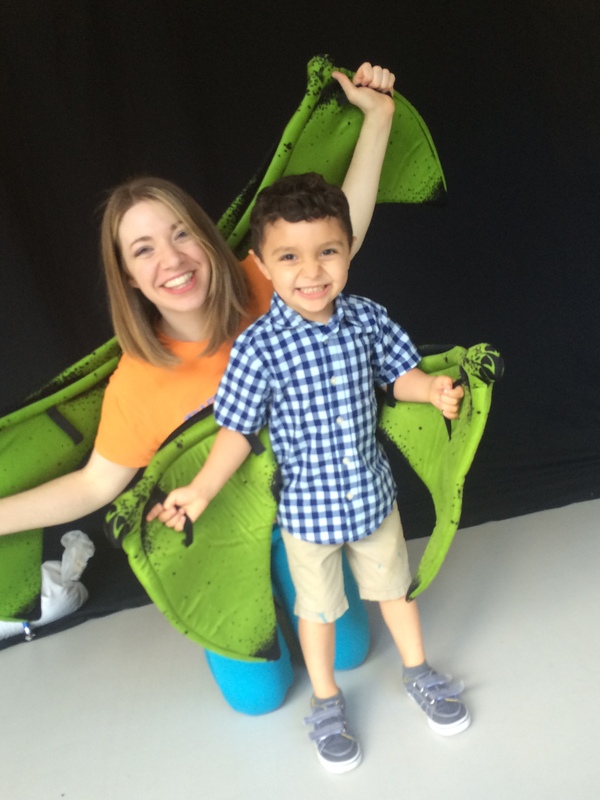 But as a museum professional, I was fascinated at what Kristin had to say about how working at the PlayHouse has changed her approach to playing with her son. There are two reasons that this felt worth sharing on the Museum Questions blog. First, Kristin is an experienced museum professional, having worked for many years at the Frank Lloyd Wright Trust. So her response to the PlayHouse illuminates something specific to what children’s museums have to offer. Second, I know we are all always looking for stories about the impact our work can have, and this is a good one! Growing up, I was the youngest of three children, so I wasn’t around younger kids much – I just followed in the footsteps of older kids, and went with the flow. At the PlayHouse I am learning more about the kinds of projects you can do with younger kids, and how your choices can impact their development. I love thinking about “open-ended play” – it’s not something I was familiar with. I was much more familiar with activities where you tell kids “make something that looks like this.” But the PlayHouse philosophy is that we offer instructions that are open enough that visitors can make lots of choices – we want to be surprised by what they come up with. That’s what we mean by open-ended play. I encourage more exploration with materials now. Simple things especially. I love giving my son, George, a chunk of play dough and seeing what he does with it. George loves sticks and rocks more than any toy. I’m trying to come up with ways he can use sticks and rocks other than as weapons. 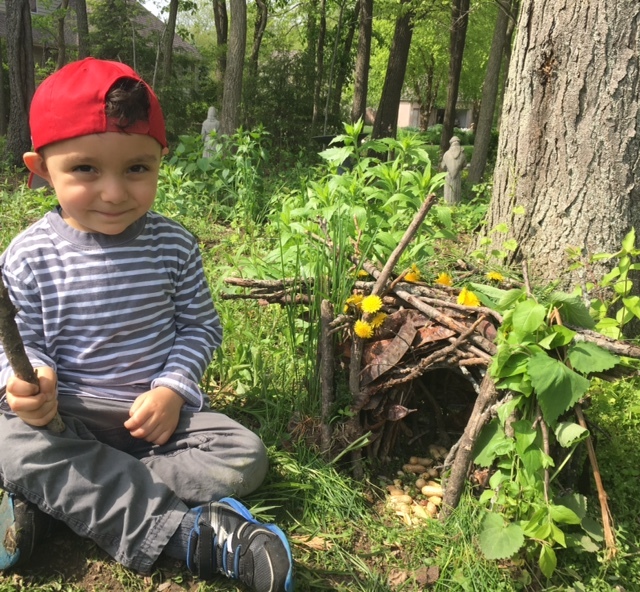 So, inspired by a PlayHouse workshop, we built a house out of sticks in our yard. We call it our bird house, but we want to make it comfortable for all animals (maybe this is inspired by the PlayHouse’s commitment to welcoming all children and families!). So we have adapted our birdhouse over the past few months. In the summer we added wildflowers around it, which actually started to grow. More recently we added evergreen branches. We put out bird food, and even some of our table scraps. We love checking on our bird house. Last weekend we did some reinforcing, with more sticks and pods and grasses. We also go around the yard and use the sticks to dig in the dirt and look at bugs. 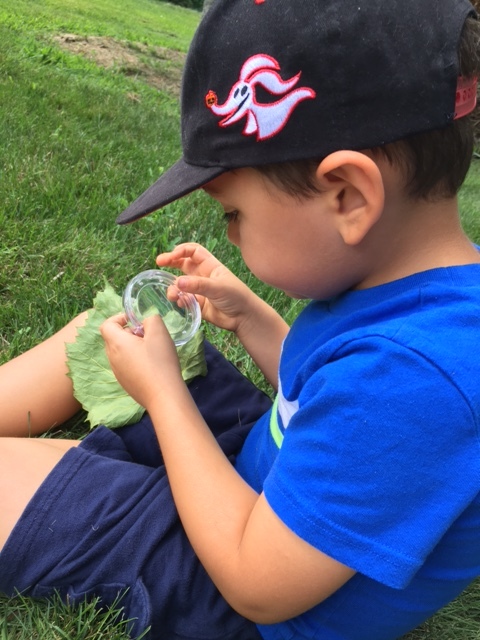 I bought a magnifier from the PlayHouse store, which we use to look at bugs. 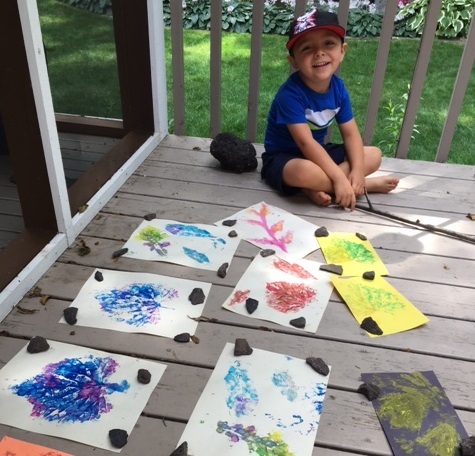 Last weekend we used it to looked at leaves, too, and then we made imprints by painting the leaves and then pressing it on the paper. George got to choose the leaves he wanted to use, and the colors he wanted to use, and what leaves to put together on one sheet of paper. And we looked on line to learn more about the veins of leaves. We also experimented by using the branches from pine leaves to make different markings paint. It looked terrible – it just looked like splotches! George didn’t mind, though: He did not have pre-conceived idea of what it would look like, so it looked good to him. Afterwards we talked about which were our favorites, and why. Now, when I’m thinking about gifts to buy George, I think about what will offer him the opportunity to think creatively. For his birthday I found blocks with pictures that kids can use for storytelling. 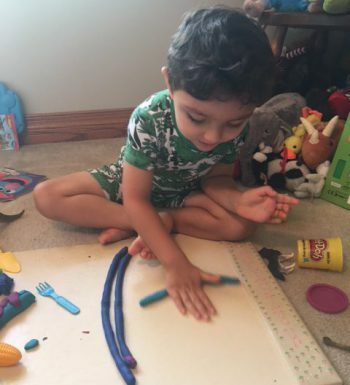 I liked the toy because it involved using blocks, while teaching him ways to create stories that are a little bit deeper. It turns out that there are complicated directions to these story blocks, so we have found our own simpler ways to play with them. We look at the pictures for ideas for characters for our stories. Creativity is important. To help kids be creative give them lots of choices, and don’t worry about what the end-product will look like. Even things that seem closed-ended can be open-ended. Be open yourself – you don’t always have to follow the rules. Make up your own rules for a game. Allow kids to do things that you think are a little bit scary. Like using real carpentry tools to build things, or experiment with different gardening tools. Find new ways to use really basic materials. Like sticks. ← What if our school programs didn’t align with curriculum standards?